PHILADELPHIA—In a brightly-lit seminar room above a gym at the University of Pennsylvania, Girmaye Misgna stands in front of a large digital display, pointing to a bird’s eye view of a house nestled among the trees. The two dozen volunteers packed around the long white table watch attentively, their own laptop screens mirroring Misgna’s satellite snapshot of a Puerto Rican community in the north coastal municipality of Arecibo. As the smell of pizza wafts through the room, Misgna shows his audience how to mark a building and upload it to Humanitarian OpenStreetMap, an open-source mapping platform providing digital maps of buildings and roads to aid organizations in Puerto Rico. The maps are being assembled all over the world, by an international army of volunteers with internet connections and a desire to help. There’s plenty of work to be done. In less than five minutes, Misgna’s training tutorial is over, and the volunteers are ready to get started. It’s been three weeks since Hurricane Maria slammed into Puerto Rico as a powerful Category 4 storm, and the situation on the ground remains dire. Nearly half of the island’s telecommunications are still out, and less than 20% of residents have had their power restored. Forty percent of Puerto Ricans still lack running water, and some are resorting to truly desperate measures. The island’s health care system is a nightmare of understaffed hospitals operating on limited generator power. Conditions are particularly bad outside of Puerto Rico’s major cities and in the commonwealth’s mountainous interior, where some communities remain cut off from the outside world. Frustrated by the slow federal response, many people in the United States and elsewhere are searching for some small way to help. And it turns out there is something that aid workers are badly in need of: high quality map data. Organizations like the Red Cross, and even US government emergency responders, need more information on the island’s buildings and roads. That’s why mapathons have been springing up all over the country for the past few weeks, including events at Columbia and Boston Universities, Trinity College, and the University of Nebraska Omaha, according to PBS. Thousands of people are logging hundreds of hours on the Humanitarian OpenStreetMap website, adding as much data to poorly-mapped regions of Puerto Rico as possible. Humanitarian OpenStreetMap launched in 2010, in response to the magnitude 7.0 earthquake that devastated Haiti. Since then, it’s connected volunteer mappers with aid organizations to help improve digital information all over the world when there’s a humanitarian need. This year, following a spate of natural disasters, Humanitarian OpenStreetMap has put out calls out to map Dominica, the Bahamas, the Virgin Islands, and most recently, Puerto Rico. According to Dale Kunce, information and communication technology and analytics lead at the Red Cross, his team turns Humanitarian OpenStreetMap’s digital data into paper maps that get disseminated to aid workers on the ground in Puerto Rico every day. Those maps help workers figure out who needs help and how to get to them. And it isn’t just nonprofits making use of crowdsourced data: “The Open Street Maps we use are the same ones FEMA uses,” he says. 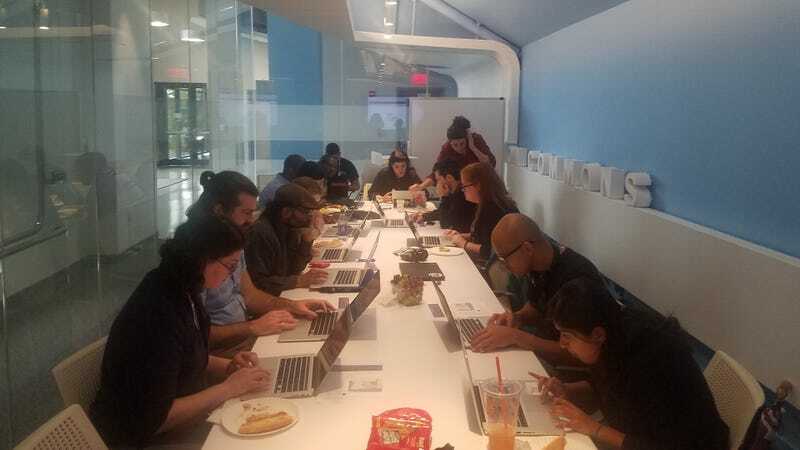 The Penn mapathon was organized by Misgna, Salomón and a handful of other librarians, including some of the same folks who launched DataRescue, a grassroots effort to scrape climate data off federal websites that swelled into a national movement shortly before Trump took office. The goal of the volunteers assembled today—a diverse group of students, community organizers, and even one woman who left her home in Puerto Rico in wake of the storm—is to digitize all of the buildings in a roughly 350 square mile region between Arecibo and Utuado that the Red Cross requested data on. A mix of Spanish and English conversations fill the air as folks settle into a rhythm: clicking on unexplored satellite pixels, zooming in, and carefully logging all of the buildings in the scene before moving on. Humanitarian OpenStreetMap works with aerial imagery and other geospatial data provided by a variety of public and private sources. Today, the team is working off satellite images collected by geographic information systems software company ESRI in July. It’s entirely possible that many of the buildings on their screens are no longer standing. Within an hour, Misgna is excited to announce that the area they’re working on is nearly 70 percent complete. It was 68 percent complete when they started, but it is still progress. And they’ve got several hours to go. Salomón says that for her, helping out in this small way is personal. She’s anxious for her family back home, in the western Puerto Rican city of Mayagüez, with whom she’s had limited contact since the storm. All told, the volunteers aren’t powerless at all. Kunce estimates that over the past two and a half weeks, more than 700,000 buildings in Puerto Rico have been mapped.